Who has access to data they shouldn't have? Who is trying to read protected data? Has there been any anomalous file activity? reporting for improved data security and information management. To comply with external regulations and ensure business continuity, organizations must audit their file servers to secure sensitive data against leaks and unauthorized modifications. Netwrix Auditor for Windows File Servers automates file server auditing and reporting, thereby mitigating the risk of compliance failures, data breaches and availability problems. "We needed a way to audit data and files related to police evidence. 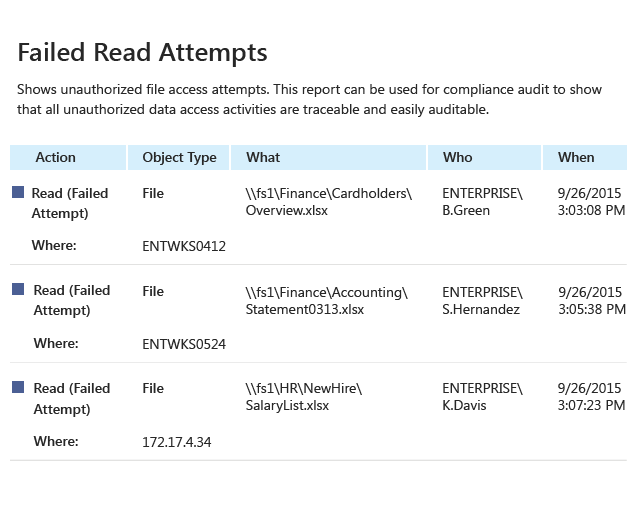 Netwrix Auditor gives us the ability to provide an audit trail of any file activity and ensures sensitive data is protected." Quickly satisfy both internal and external auditors by answering questions such as who changed file permissions or who deleted files from the file server. This information can be stored in the two-tiered (file-based + SQL database) AuditArchive for more than 10 years. 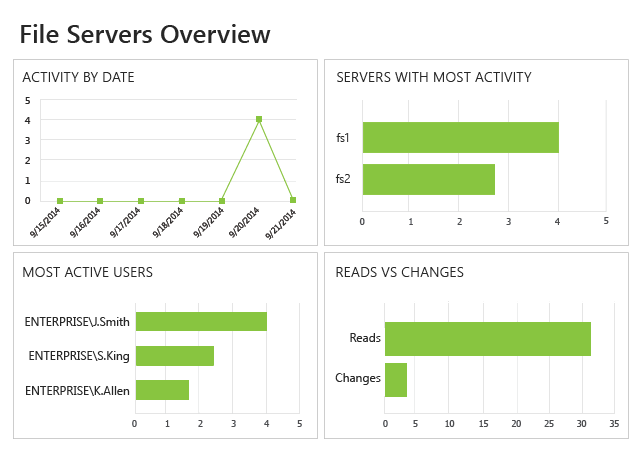 Overcome the limitations of native auditing tools with Netwrix file server reporting software. Instead of struggling with time-consuming and error-prone manual process, IT administrators can quickly produce reports for stakeholders on changes to files, permissions and data access attempts. They can also quickly identify, investigate and remediate problems — for example, by detecting the unwanted deletion of a business-critical file and restoring it from backup before the change interferes with someone's work. 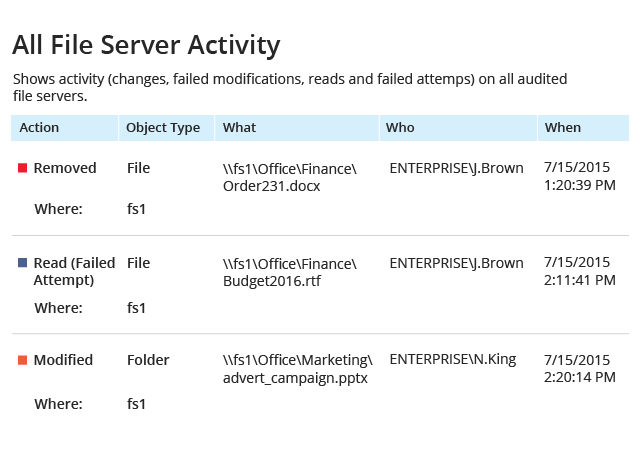 Identify suspicious activity that might put data security at risk using out-of-the-box reports on file server changes. 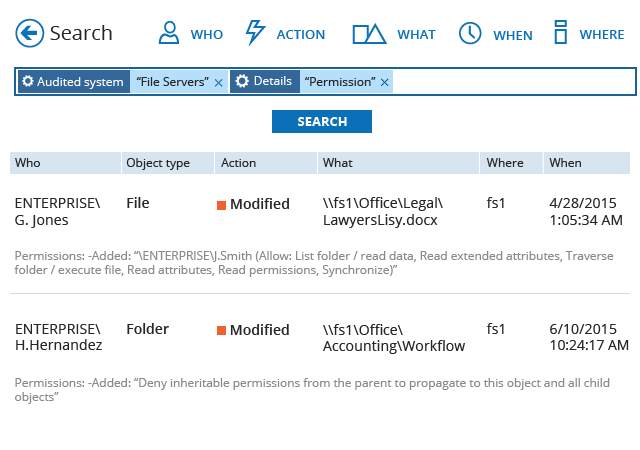 You can view additions, deletions and modifications of files and shares; changes to file and folder permissions; and file access attempts (both successful and failed). Then use Interactive Search to investigate the activity further and determine how to prevent similar incidents from occurring in the future. 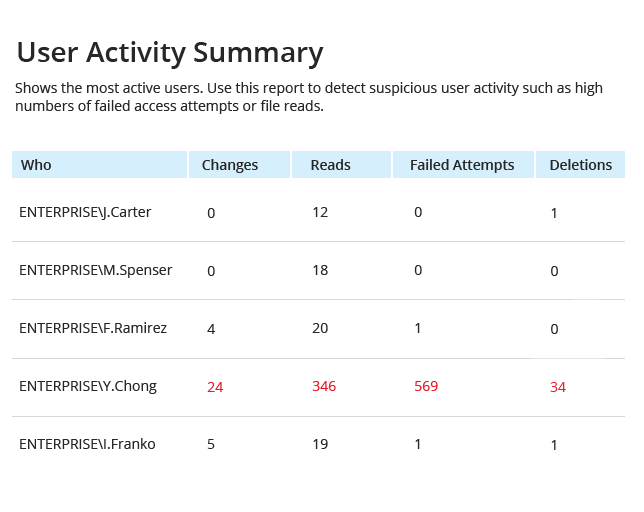 Quickly detect excessive access rights to find and remediate potentially overexposed data to prevent a data leak. 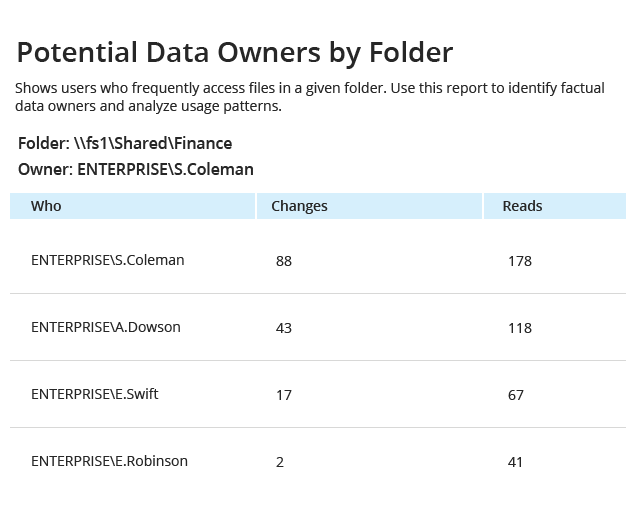 Prevent data sprawl and facilitate cleanup for improved user productivity and optimized storage by identifying empty folders and duplicate or unused files, along with their size and owners. Zoll Data Systems relies on Netwrix Auditor for Windows File Servers to streamline HIPAA and SOX compliance. With Netwrix Auditor for Windows File Servers, FXCM ensures customer data security and proves its compliance with multiple industry regulations. The Donohoe Companies deployed Netwrix Auditor for Windows File Servers to solve its data security and accountability challenges. Banglalink uses Netwrix Auditor for Windows File Servers to maintain business continuity by quickly investigating and remediating incorrect or unauthorized file changes. Configuration auditing performs a baseline of configuration settings, software or files against a defined desired state. Audit and compliance needs are driving new functionality in the areas of broader change detection and reconciliation to approved change requests. File analysis enables storage managers, legal and security professionals, and business analysts to better understand and manage unstructured data stores. As a result, you can reduce costs and risk, increase the efficiency of business-critical data, and make better information management decisions for unstructured data. For organizations that rely on EMC storage appliances, EMC auditing is critical to data protection, enforcement of internal controls and adherence to external regulations. Netwrix Auditor for EMC tracks every change on EMC Isilon, VNX, VNXe and Celerra devices and converts audit data into human-readable reports. You can easily see who made each change, when and where it happened, and what was changed, including the previous and current values. By default, file systems lack any easy-to-use change and configuration auditing. Therefore auditing a file system becomes an exhausting manual process. Logging into each server, searching through hundreds of event logs, formatting reports and distributing them on a scheduled basis takes too much time and is prone to error. Lack of proper file server permissions audit capabilities puts critical data at risk. 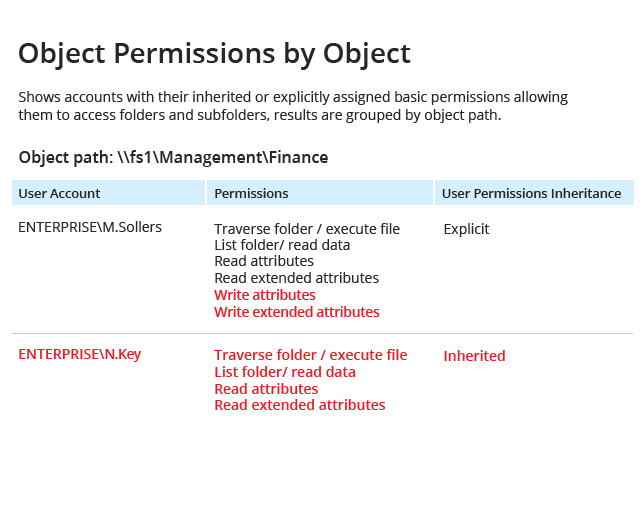 Accidental or malicious changes to file permissions can lead to unauthorized access or unwanted changes to content that result in data loss, interrupted business processes or failed compliance audits. 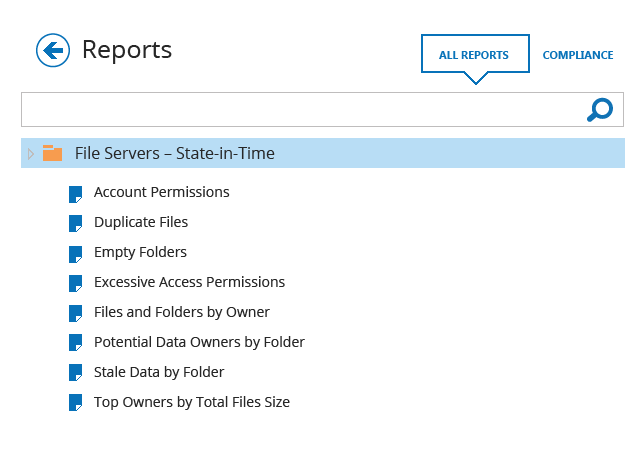 The file permissions audit tool from Netwrix provides a complete picture of the current state of permissions, as well as the changes to permissions that took place within a specified time frame. It helps IT administrators confirm on a regular basis that only eligible employees in their organizations have access to confidential files and that no file permissions are changed without their approval. In order to protect business data on file servers and keep storage costs under control at the same time, enterprises need to gain visibility into everything happening on file servers. Who has access to what? Are there any redundant permissions? Which files and folders are no longer in use and can be defensibly deleted? Who owns the largest files? With file analysis technology that helps answer these questions, it’s much easier to make informed decisions regarding further data management actions. Netwrix Auditor for Windows File Servers provides detailed file analysis reports that enable security professionals and storage managers to better understand their organizations’ data structures and their usage, so they can make proactive and well-informed information management decisions.